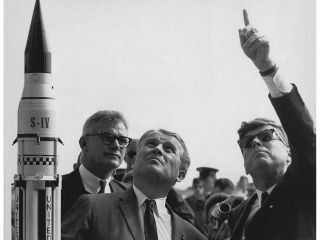 One of the greatest rocket scientists of all time would have been 100 years old on Friday (March 23), and his legacy is being celebrated in his adopted home town of Huntsville, Ala.
Wernher von Braun was a German engineer who came to the United States at the end of World War II after working for the German war effort designing the V-2 combat rocket. Despite his past and affiliation with the Nazi party, von Braun went on to build the rockets that would carry U.S. astronauts to the moon and establish America as a leader in space for decades to come. He became a United States citizen in 1955. "He was very unique," recalled American aerospace engineer David Christensen, who worked with von Braun when he arrived in the United States. "I don't know of another individual, frankly, that's had those capabilities, either then or now, that could do the things he did." Christensen, who will turn 80 on April 7, will speak along with others who knew von Braun at a University of Alabama in Huntsville commemorative event on Friday. "I met him the first day on the job in February 1956," Christensen recalled. "He'd forgotten his belt that day and had taken a piece of rope and tied it around his waist. He was a very warm personality." Von Braun's team, which was transferred to NASA's Marshall Space Flight Center in Huntsville in 1960, went on to develop the Redstone, Jupiter and Saturn rockets that launched America's space program. Von Braun became the center's first director, and presided over the development of the world's tallest, heaviest and most powerful rocket, the Saturn V, which lofted Neil Armstrong, Buzz Aldrin and Michael Collins to the moon in 1969. Despite his outsize intellect, von Braun "didn't act that way," Christensen told SPACE.com. "He was very down to Earth and friendly, never talked down to anyone. But talking to him, working on a project, you learned very quickly he was a genius." Though the team was gifted, it took tremendously hard work to achieve what they did as quickly as they did it, Christensen said. "Everybody worked very hard," he remembered. "Some of the people worked themselves into the grave, lost their wives, working round the clock. Von Braun was only 65 when he died. It was a dedicated effort." Still, Christensen said their leader found time for more than just rocket science. "He was a very broad-based individual, very culturally capable; he played several musical instruments, wrote music, he was an astronomer and he was certainly a top notch engineer," Christensen recalled. However, for some, von Braun's legacy is also weighted with his involvement in German war activities, as well as his status as a Sturmbannführer of the SS and former member of the Nazi party. "The V-2s were manufactured at a forced labor factory called Mittelwerk," states NASA's Marshall Space Flight Center history website. "Scholars are still reassessing his role in these controversial activities." Yet Christensen says he and the members of von Braun's team were focused on their work, and not the past. "Among all the coworkers, there was no animosity, though maybe there was with some of the people in the town," Christensen said. "In working with him daily you get very well acquainted. Everybody worked as a team, whether they were German or American." Certainly, von Braun's contribution to rocket science is warmly recognized in both his home and adopted countries, as well as beyond. In addition to various buildings and institutions named after him in Huntsville, there are numerous streets that bear his name in Germany, and even a crater on the moon is called von Braun in his honor.